With the early 1880s construction of the Canadian Pacific Railway through southern Alberta the transportation connection with the manufacturing and population centres of the east was vastly improved. The Hudson’s Bay Company took the opportunity to then modernize its transportation system in the north. Linking this southern railway system with the remote trading posts of the north required the construction of three steam-driven riverboats to operate on the Mackenzie, Slave and Athabasca rivers. The total distance from Athabasca Landing, 130 kilometres north of Edmonton, along these waterways to the Mackenzie Delta was close to three thousand kilometres. 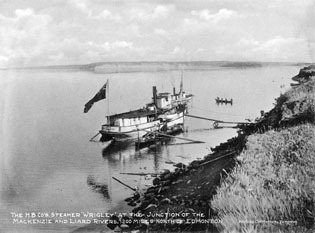 In 1883 the Hudson’s Bay Company launched the S.S. Grahame at Fort Chipewyan. Its regular run was from Fort McMurray, in northeastern Alberta, to Smith Landing (now Fort Fitzgerald) on the Alberta-Northwest Territories border. Three years later, in 1886, the S.S. Wrigley was launched at Fort Smith (map) and began regular freight and passenger service to the Hudson’s Bay Company trading posts along the Slave River, Great Slave Lake, and the Mackenzie River as far north as the Peel River trading post of Fort McPherson. The final link in this remarkable transportation system came in 1888 with the launch of the S.S. Athabasca at Athabasca Landing (now Athabasca).